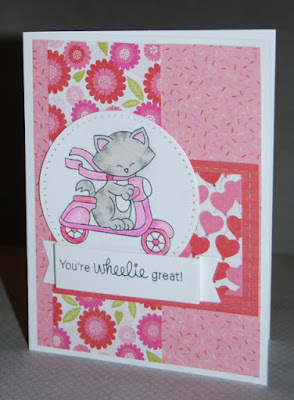 The current Inky Paws Challenge is called "In the Pink", so I gave this cutie a scooter all done up in pink and red. The patterned papers are called Be Mine and are by Pebbles. There are so many fun patterns to mix and match for Valentine's Day. So fun with those cute pattern papers and Newton looks darling on the pink scooter! Thanks for sharing with us at Inky Paws Challenge! Absolutely adorable card. We are grateful that you joined our Challenge here at Word Art Wednesday. Leaving you with the inspiration that comes from God's Word in Romans 1:17 which says, "For in the gospel the righteousness of God is revealed—a righteousness that is by faith from first to last, just as it is written: “The righteous will live by faith.” Have a blessed week. So cute, love the image! Thanks for sharing with us at 4 Crafty Chicks. super cute card, luv the cute image! I am so glad you played along with us at simon says stamp wednesday challenge! Adorable card! I love all of those pinks! Thanks for playing along with us at the Inky Paws Challenge!